The VVS Medical Ontology is a simplified version of the MSH ontology, since the current version of the MSH ontology is too broad and covers a lot of concepts focused on diagnostic measurements which are outside the scope of the VVS system. In addition, the VVS Medical Ontology (MO) is more focused on the acquisition and segmentation/3D reconstruction procedure (for practical reasons), is less complex and has direct links to the AIM@SHAPE Common Shape Ontology (CSO). 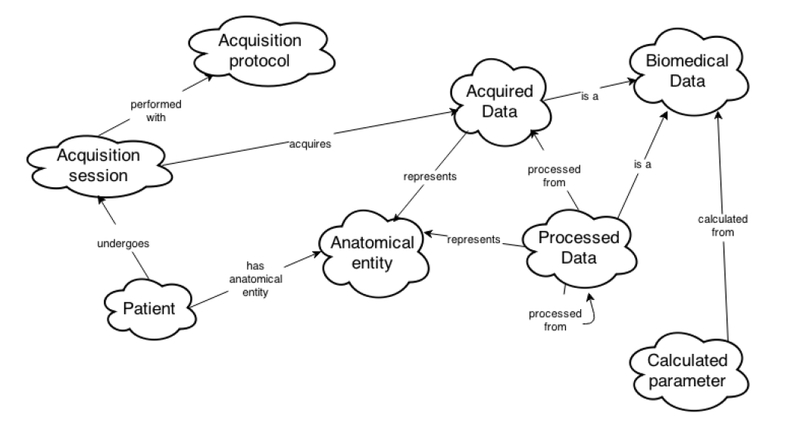 An overview of the VVS Medical Ontology is shown in the following diagram. An overview of the MSH ontology (upper level classes and main relationships) as described in the MultiScaleHuman (MSH) deliverable D8.2 is shown in the following diagram. The MSH ontology contains parts of the Foundational Model of Anatomy ontology (FMA), which is designed to provide anatomical information regarding the structure of the human body. FMA is constrained to “pure” anatomy, i.e., the structural organization of the body and arranges its classes in an inheritance hierarchy or taxonomy in a strictly structural context. However, the MSH ontology is more patient specific and diagnosis oriented. The following screenshot from Protege demonstrates the VVS Medical Ontology class hierarchy and the imported AIM@SHAPE Common Shape Ontology (CSO) and Common Info Ontology.